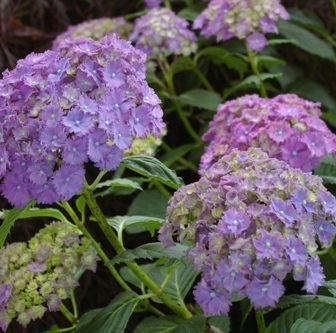 Joy Creek Photo Archive (c) all rights reserved In our soil the large mop heads of Hydrangea 'Parzifal' (J. Wintergalen, 1922) have red streaked, deep purple florets with white central eyes. Attractive and relatively small dark green foliage. The plant starts to bloom early and continues to bloom on new wood as well. Early and late summer. 3-5 ft.